INTEGRALHUMANDESIGN is based on the central notion that human beings are consciousness-in-form, and that life is a magical dance in this realm between heaven and earth, between consciousness and form. If we only look into the sky and see the limitless possibilities of consciousness, we may lose ground. If we only look into matter and see the limitations inherent in the mechanics of the form, we may lose our evolutionary momentum. Our maximum potential emerges in this dance between the two poles, in a space where we transcend and include both of them. INTEGRALHUMANDESIGN displays and describes central elements of the uniqueness of each human being with striking accuracy and differentiation. From the perspective of the form principle, it allows you to see the millions of shapes a human form can take, and supports you to let yourself and others be who we are designed to be. From the perspective of awareness and the evolution of consciousness, it unfolds the spectrum of developmental levels and corresponding frequencies and belief systems, which provide orientation in your process of becoming more and more aware. The purpose of INTEGRALHUMANDESIGN is to guide you to the best possible expression of your unique potential. The information about the anchor points your uniqueness is available in personal evaluations and conveyed in personal consultations, webinars and trainings. 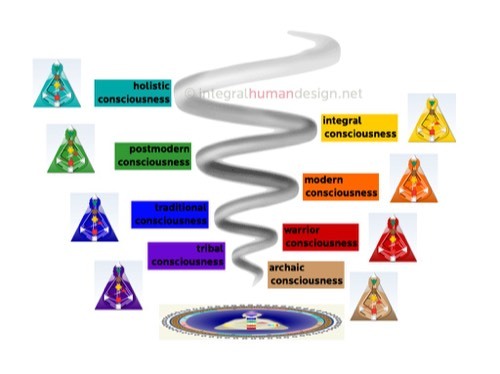 Personal INTEGRALHUMANDESIGN Evaluations are calculated from the time, date and place of your birth and display the inner workings of your human form, and a spectrum of possibilities for the evolution of your consciousness. The data gained from the calculation highlight specific Gene Keys, which translate into your personal growth themes and are displayed in two ways: a BODYGRAPH and a GOLDENPATH. These provide an overall picture of the anchor points of your uniqueness as well as specific doorways to your awakening. The BODYGRAPH Evaluation displays the inner workings of your human form in three frequency bands. The structure of your specific imprint can show you how to differentiate your core self from conditioned beliefs and behaviours. The three frequency bands of Shadow, Potential, and Essence allow you to become aware of your attitude and inner frequency, and explore how your attitude affects the expression of your imprint. The GOLDENPATH Evaluation contains three sequences - Activation Sequence, Venus Sequence and Pearl Sequence - that are doorways to living authentically at your maximum potential. These sequences show you how to anchor yourself in your core stability, connect fully in the relational space, align yourself with your core purpose and vocation, and offer your core contribution in the world. The journey into your essence has three facets which take you into, through and beyond your Self. One facet is the journey into your Self. This is the process of finding out how you are designed, and who you really are in your distinctive uniqueness. The second facet is the journey through your Self. This is the path of healing and re-connecting to your essence. The third facet is the journey beyond your Self, beyond personal identification and attachment. You start from where you are, and you go where you need to go next - where your personal evolution takes you next. The journey is yours, you can stay wherever you want. The INTEGRALHUMANDESIGN map comprises the whole of the journey - all the way into the Self, through the Self and beyond your Self. It speaks to the full spectrum of your possibilities, and the choice is yours.